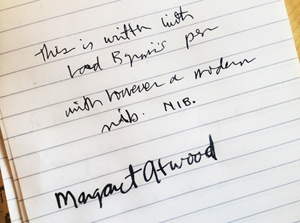 By Atwood Society in Margaret Atwood on December 1, 2012 . On November 28 at the Canada House on Trafalgar Square, Margaret Atwood was named a Companion of Literature and inaugurated as a Fellow of the Royal Society of Literature. No more than ten writers are Companions at any one time, and it is considered the RSL’s highest honor. Fellows sign into a great roll book using either Byron’s pen or Dickens’s quill; Atwood used Dickens’ quill. (Though she tested both out first in the editor’s notebook).